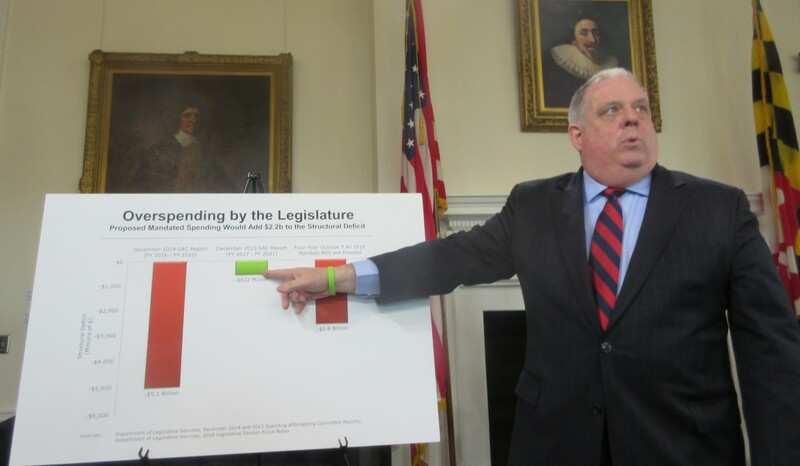 At news conference, Hogan points to structural deficit figure before new mandates were introduced this session. Budget Secretary David Brinkley sparred with Democratic legislators Tuesday over the Hogan administration’s proposal to gain relief from legislative spending mandates that exceed projected revenues. Prior to Brinkley’s testimony before the House Appropriations Committee, he joined Gov. Larry Hogan at a press conference in which the governor defended the initiative. “Our proposal will ensure that future budgets continue to prioritize key expenditures like education and healthcare, but it also makes sure that leaders will have the flexibility to trim excessive cost increases in tough times,” Hogan said. Brinkley told the committee that HB449, the Relief From Budget Mandates, would protect existing education mandates and promote fiscal responsibility. Budget Secretary David Brinkley testifies at House Appropriations Committee. “HB449 allows for limits in mandating spending beginning in FY 2019 to FY 2018’s levels, with four exceptions: state aid to K-12 public education, the state’s pension contribution, appropriations to the rainy day fund, and debt service payments,” Brinkley said. Mandated spending would increase only in those fiscal years in which revenue growth as measured by the Board of Revenue Estimates each December, is 2% percent greater than the prior December revenue estimates, Brinkley said. Brinkley also criticized Democrats for proposing new mandates, as the governor had at a news conference just an hour before. According to the bill’s fiscal note, beginning in FY 2019, the governor would have the authority to significantly reduce existing mandate expenditures that are not exempted by the proposed statute. Future mandated appropriations could also be affected, as their funding may be reduced by the General Assembly to offset payments allocated to newly proposed mandates. Local governments would also be affected, as the governor would be authorized to significantly reduce funds that state gives to municipalities. Committee chair Del. Maggie McIntosh D-Baltimore City inquired about provisions related to what is commonly referred to as the “BRFA” (Budget Reconciliation and Financing Act), a commonly used budgetary tool that adjusts spending mandates and formulas to match revenues for the fiscal year. This is the first year in at least a decade that a governor has not used a BRFA bill (pronounced burfa), reducing spending mandates to balance the budget, since Hogan has completely funded all mandated spending programs. McIntosh expressed concerns that the executive branch was indirectly trying to override legislative input over mandates. McIntosh asked Brinkley if any other states grant the governor such extensive budgetary powers and was told none did. Brinkley said that was a possibility because those funds do not fall into the four categories exempted by the proposed mandate. Del. Marc Korman, D-Montgomery, was also concerned about community colleges and suggested reimbursement rates might be affected. Bernie Sadusky, executive director of the Maryland Association of Community Colleges, testified against the bill, and suggested that higher education mandates are partially responsible for facilitating Maryland’s upwardly mobile population. “What’s been the return on our investment? We have an outstanding higher education system, we have one of the most highly educated adult populations in the United States and when we look at our per capita we income we certainly can link that to higher education,” Sadusky said. Tina Bjarekull, president of the Maryland Independent College and University Association, worried that the proposed bill would jeopardize the Sellinger program, which partially allocates state revenues to independent colleges. “We believe this bill would have a devastating impact on funding for higher education and really sever a long standing commitment to a broad and diverse system of higher education, Bjarekull, said. Dr. Sandra Kurtinitis, president of the Community College of Baltimore County, also testified against the bill, as did representatives of other educational institutions. 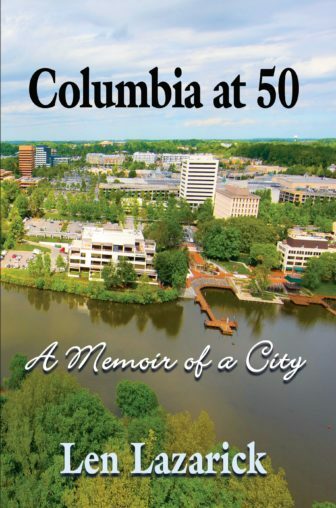 Roy Meyers, a political science professor at UMBC and an expert on state budgeting, was the only proponent who testified besides Secretary Brinkley. He spoke in favor of the bill and increasing flexibility, and said the committee should not dismiss the idea simply because it wasn’t perfect.